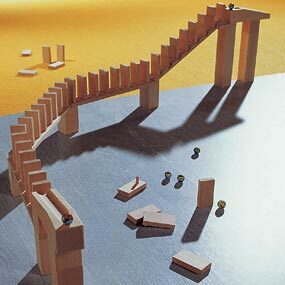 HABA 1133 - Little marbles make a great effect - if one little block falls, the rest will fall in a fascinating chain reaction, even uphill. This set contains 2 bridges, 40 little dominos, 1 staircase, 2 sloped tracks, 6 building blocks, 1 overpass, 1 support and 6 glass marbles. Base measures 1.5" x 1.5". Made from solid hardwood. Compatible with all Haba building block sets (T.C. Timber not included).